The alarm came in at 2 in the morning. 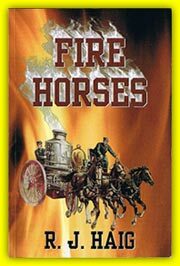 It was a hot summer night and I could smell the distinctive odor of wood smoke as we pulled out of quarters. The fire was reported as an occupied four flat on West Fort Street. The location was right around the corner. It was less than six blocks from the Fire House. We would have to gear up quickly. We could see the flames coming from side windows at the rear of the second floor. The place was really starting to roll. Huge volumes of smoke soared into the night sky. It was a worker and people were still inside the building. I was in charge of Ladder 13 that night. I had a good crew riding with me. They were professional and didn’t need direction. I placed the apparatus directly in front of the structure and jumped out to help my men put up a ladder at the side of the building. My driver had the aerial swung up and onto the second floor porch in less than a minute. Our sister company, Engine 33, stretched two lines to the front entrance. The pipe men waited as the rig sped toward the nearest hydrant with line spilling off both hose beds. We could hear people yelling and screaming as they fled the raging flames. Most of the occupants were able to get out of the building using a stairwell that led down from the upstairs hallway to the front porch. Checking the upstairs bedrooms we found a baby someone had left in the panic of evacuating the apartment. The Firefighter who rescued the child handed her to me and returned to search for more victims. I moved to where a crowd had gathered and looked for someone to take the child. A wide eyed man stood a few paces in front of a large group of people. He reached out and I started to give him the baby. The crowd reacted in a negative manner and I sensed trouble. I turned and gave the baby to a woman who huddled the child in her arms and hurried to the back of the crowd. I returned to the fire. I was puzzled by what had just happened. It was a no brainer for the arson guys. The police had captured the crazy guy who caused all the trouble. I followed up a few weeks later to see what happened to the arsonist. I was told he was still babbling incoherently and had been shipped to the funny farm. We were sad about the loss of life at the fire but were glad about the quick stop and the rescue of the child. It was just another typical night down in the 7th Battalion.